LASIK (laser assisted in-situ keratomileusis) is the most common laser vision correction procedure performed today and can correct a wide range of conditions, including nearsightedness, farsightedness, and astigmatism. Our doctors provide laser refractive surgery consultations and pre and post-operative care for our laser patients. Using a highly accurate, cold beam excimer laser, the LASIK surgeon reshapes the cornea (the clear window on the front of the eye) to focus light rays directly on the retina. During LASIK surgery, a thin corneal flap is created bladelessly with a laser. The corneal flap is gently folded back and the excimer laser uses pulses of invisible ultraviolet light to gently reshape the internal tissue of the cornea. Each pulse of the laser removes only a minute amount of corneal tissue - about 1/500th of the thickness of a human hair. 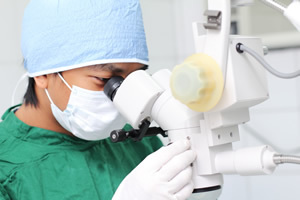 Depending on which is applicable, the laser is either guided by a computerized map created specifically for your eye or by the surgeon's skilled adjustment of the laser. The surgeon has full control of the laser and can turn it off at any time. Once the cornea is reshaped, the corneal flap is replaced in its original position where it adheres quickly and seals itself without the need for stitches. The surgery only takes about five minutes per eye, and there is very little discomfort, either during the surgery or after. Typically, by the day after surgery, LASIK patients see well enough to drive and return to work. PRK (photo-refractive keratectomy) and LASEK (laser epithelial keratomileusis) are both advanced surface ablation procedures used to correct vision by using the excimer laser to shape the surface of the cornea, rather than the interior. PRK was the first FDA-approved procedure changing the curvature of the cornea with the excimer laser. Safety and clinical data on the first PRK surgeries date back to 1990. PRK and LASEK use the same excimer laser as LASIK and the same Wavefront mapping, but the procedures are performed on the surface rather than inside the cornea. With PRK, the epithelium (top skin layer) of the cornea is actually removed; with LASEK, the epithelium is moved aside and then replaced after surgery. In each case, the laser is then used on the surface of the corneal tissue only. To assist the healing process after PRK and LASEK, a clear bandage contact lens is placed over the cornea during the 3-5 days needed for the epithelium to re-grow. Additionally, patients are normally placed on a regimen of steroid eye drops for about a week, but may occasionally have to use them for up to one to three months, requiring monitoring by their doctor on a weekly or monthly basis. Like LASIK, PRK and LASEK only take about five minutes per eye, and the surgery itself is painless. There is typically more discomfort during the healing process after advanced surface ablation procedures, and it takes a bit more time for the patient to see clearly, but in the end, outcomes for LASIK, PRK, and LASEK are the same. There are some medical conditions that may make either PRK or LASEK more suitable than LASIK. LASEK, for example, is used mostly for people with thin corneas since LASIK requires more corneal tissue to be successful. PRK is often preferred for patients who may be susceptible to dry eyes since dry eyes are more often a complication of LASIK. PRK vs. LASIK - What are the differences? In LASIK, an eye surgeon makes an incision (with either a laser or a blade) in the cornea to create a flap of tissue. The flap of tissue is lifted so the laser can be applied to reshape the inner layers of the cornea. 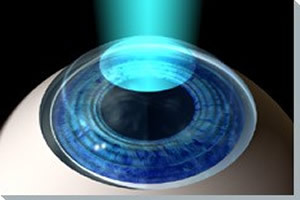 The computer-controlled surgical laser carefully reshapes the layers of the cornea to repair imperfections in curvature that lead to distorted vision. The corneal flap is then put back in place and heals over the reshaped part of the cornea in a few days. In PRK, the eye surgeon does not create a flap of corneal tissue. 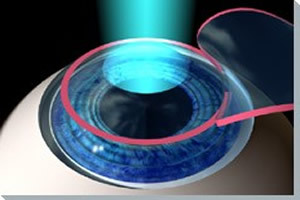 Instead, the outer layer of the cornea is removed to expose an area for a laser to reshape. This makes PRK a better choice for people whose eyes meet certain criteria, such as having thin corneas or chronically dry eyes. The most significant differences between PRK and LASIK are the initial discomfort and the speed of visual recovery. Recovery from PRK takes a little longer than from LASIK because the outer layer of the cornea needs time to heal. During this recovery time, a PRK patient is given prescription eye drops (antibiotic and anti-inflammatory drops) to promote healing and to reduce discomfort after eye surgery. The drops are normally prescribed for several months following surgery. PRK patients can expect it to take one to three days for the discomfort, blurring and other post-surgical effects to subside, and it will take up to six months for vision to reach absolute peak acuity and clarity. LASIK recovery is much faster. The discomfort following LASIK surgery is usually mild and short term. While most patients report seeing normally within several hours after the procedure, their vision continues to improve gradually for several months before reaching peak quality. Both surgeries are safe and effective and carry a very high rate of patient satisfaction. Choosing between PRK and LASIK is a decision best made in consultation with a trained eye doctor who specializes in laser eye surgery. The good news is that history has shown that whichever you choose, you’re likely to be very pleased with the outcome.